It is puzzling to watch how, in various social media (and in a wider sense as well), some Christians reach out to other Christians and interact with them as a closed circle, yet fail to extend their friendship quite so generously with those who might either be struggling with their faith, or simply not Christian at all. I suppose it’s natural to do this. Like seeks like. But when it becomes self-focused, then it also becomes less than inclusive. At least, that has been my personal observation just lately. I wonder if this is what Jesus would have intended. The Christian Church is shrinking in membership. Is this sense of exclusivity a part of the reason? A retreat behind the barricades of faith, so to speak? A feeling that “our church” is better than “your church” because WE do it right and YOU don’t? I have heard this sentiment explicitly expressed from the pulpit. It disturbed me so much (coupled with the anti-scientific mindset I encountered) that I stopped attending services anywhere. My gardens are my sacred places these days. God – genderless and remote but still present – glimmers above my head and dances in the leaf shadows. I suspect I have become something of an animist. I detect that holy but unfathomable presence in almost everything, from the stones and water to the air and light. It doesn’t wear the skin of either a man or a woman. My fundamental Christian acquaintances will no doubt be concerned for my soul and consider me damned for eternity. I have done many things worthy of damnation, after all. But is this one of them? I’ve belonged to a “traditional” church but now live at some distance from it and am no longer a participant – although I hasten to note that these are fine people with beautiful hearts. So it’s not their fault; I’m just standing outside the circle. My home congregation from childhood is in another region entirely. I have been exploring the Jewish roots of my father’s Levy lineage, with considerable and increased attention. That is the surname I’ve carried from infancy and its history is undeniable. And then there’s Yeshua, Jesus, the Jew at the foundations of Christianity. He never once claimed to be anything else but Jewish. I think too many Christians have forgotten that over the years. Western society harbours a groundswell of anti-Semitism that I find frightening. The situation in the Middle East has some bearing on this, but it’s not the whole story. There’s this knee-jerk reactionism that gets directed at a much broader spectrum. So I quietly research my name and its ancient antecedents and wonder if we will ever truly be comfortable with our own identities, any of us, regardless of beliefs or cultures or places of residence. I doubt it. Contention is inherent in humanity. We do not play well with others. If we believe otherwise, we are lying to ourselves. No one ought to get too smug about our capacity for committing acts of goodness. Meanwhile, my family’s home in Yarmouth will become increasingly our “prison” owing to my husband’s physical deterioration, thanks to ALS. Its address is not far from several mainstream churches. People from these congregations know us and many also know what we are dealing with. Yet David has received nary a visitor from any church, except Mormon – and they were total strangers to him until then. He appreciated their attention. Otherwise – nada. Nary a card. Nary a knock on the door. Nothing. He is confronted with mortality and it will be a terrible conclusion to a life bravely lived. His atheism is, I suspect, more along the lines of agnosticism. He has a keen intellect and his mind closes no doors entirely. It doesn’t need to. The religious community closes them for him. We have been the recipients of generosity from many sources but all of them were secular. I do find this curious. Still … he can hardly hike out to the nearest place of worship these days. And he’s probably not alone. Well, yes, he IS alone in that terrible sense. On his hospital admission forms, he always writes “Anglican”. He was born in England although he deems himself 100% Canadian but that one tie remains. I believe the last time he saw any clergy member one-on-one was in a hospital setting. And for a religion that originally emphasized outreach and conversion, this strikes me as rather sad. 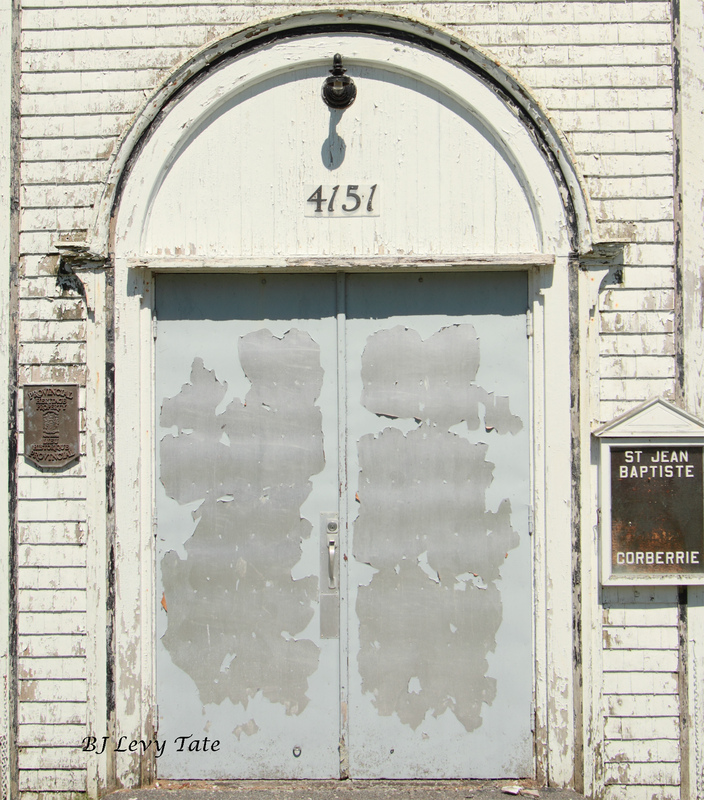 The former Catholic Church in Corberrie, NS – now unused and no longer consecrated. I took this photo on a recent drive around the area. I have never attended this church, however.